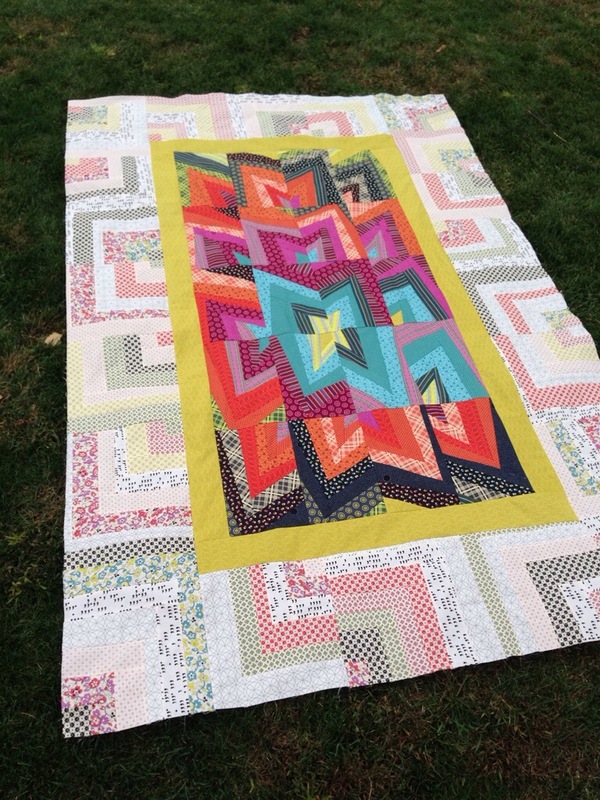 I looked back at this post and realized I’ve been working on these quilts since August. Really, I had lost track of time. 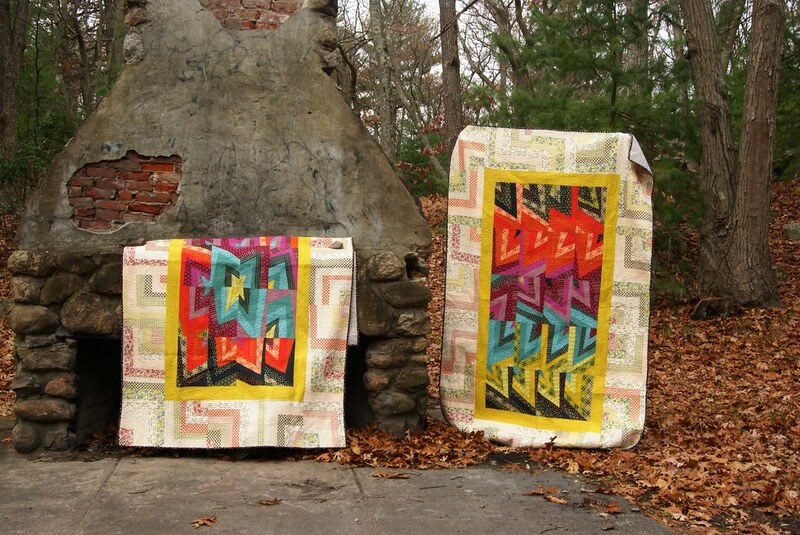 These quilts pushed me as a quilter. I started with a tiny idea, for some paper-pieced improv chevron blocks. 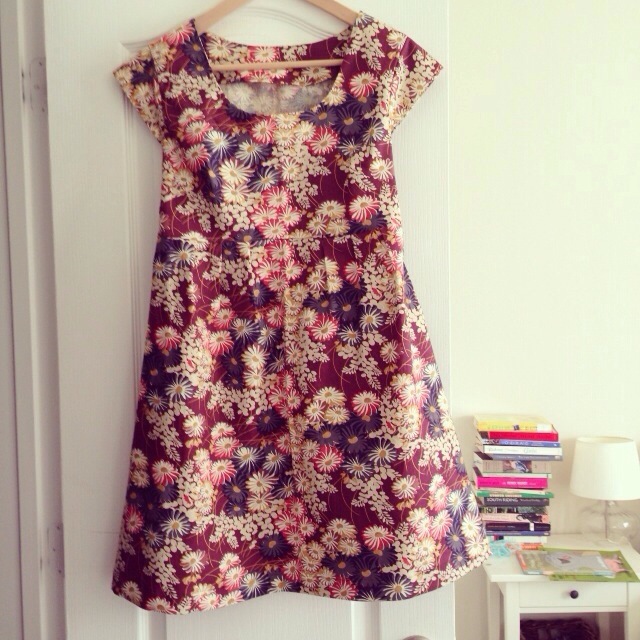 I pulled some fabric; my friends and I changed our minds; I puttered and thought and hemmed and hawed. 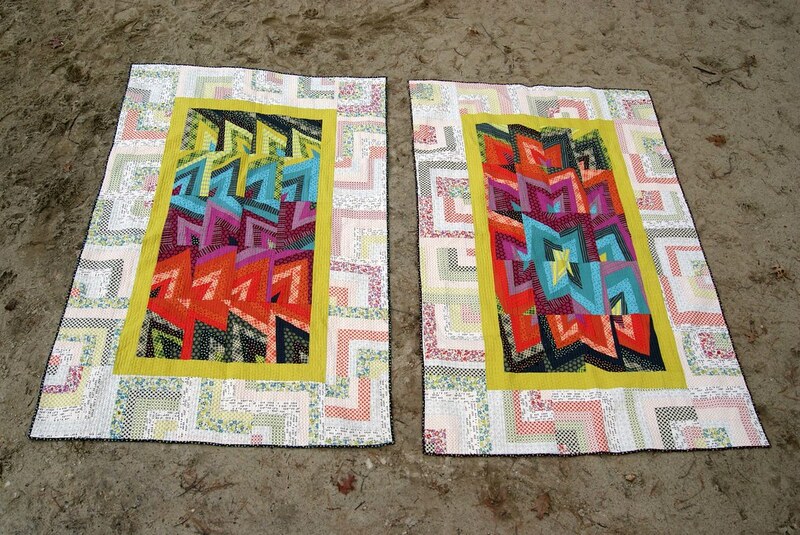 I don’t usually make quilts without patterns, you see, and starting these was a creative free-fall. And then the even more insidious worries, like, what if I think I’m being creative and original and really I just saw something like this on the internet, forgot, and then regurgitated it. What if my friends say they like them and really, they don’t. So, to me, these quilts have ended up being about me as a creator. About pushing aside those evil voices that nag at you when you’re working–voices that sometimes make you put down your work in discouragement. I’ll be pleased to make a couple of quilts from patterns as my “next things,” but these have taught me that I can make something wild and beautiful that comes out of my own head. 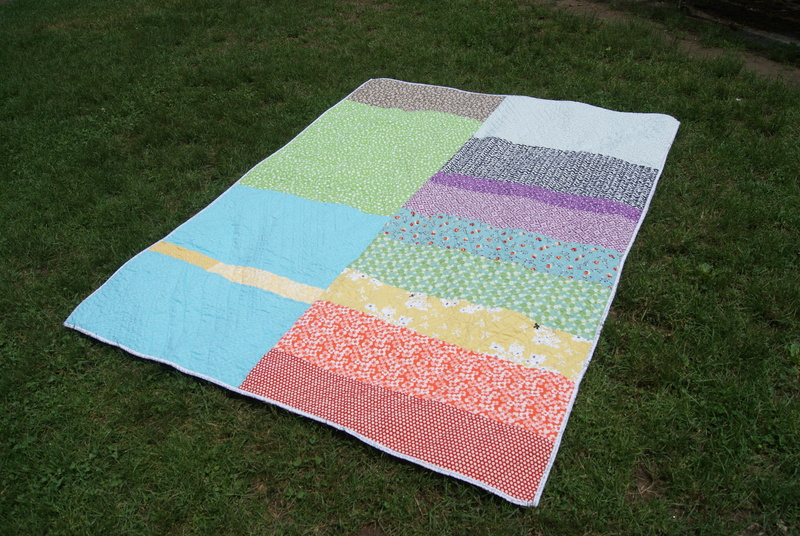 I can trust myself to do the quilt math, and make all the blocks, and do 20 hours of straight-line quilting, and produce quilted work that I’m very proud of. I’ll be mailing my big babies off on Monday, to make my friends’ home a little warmer for Thanksgiving guests. I couldn’t be gladder that I took on this challenge–and I couldn’t be prouder of the results. 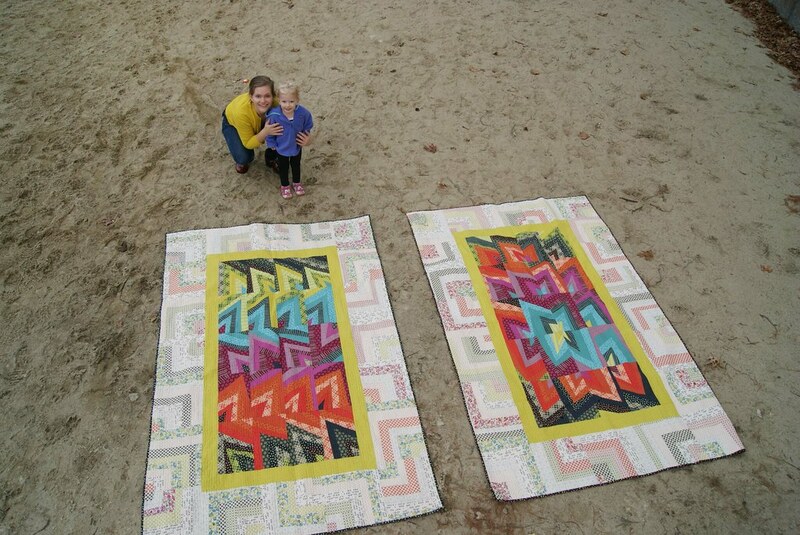 The Phoenix Twin quilts will be done tonight. I have to get them done by tomorrow so I can photograph them with Nate’s help (we’re a little stumped about how to photograph two huge quilts together) and get them mailed to Phoenix on Monday or Tuesday. 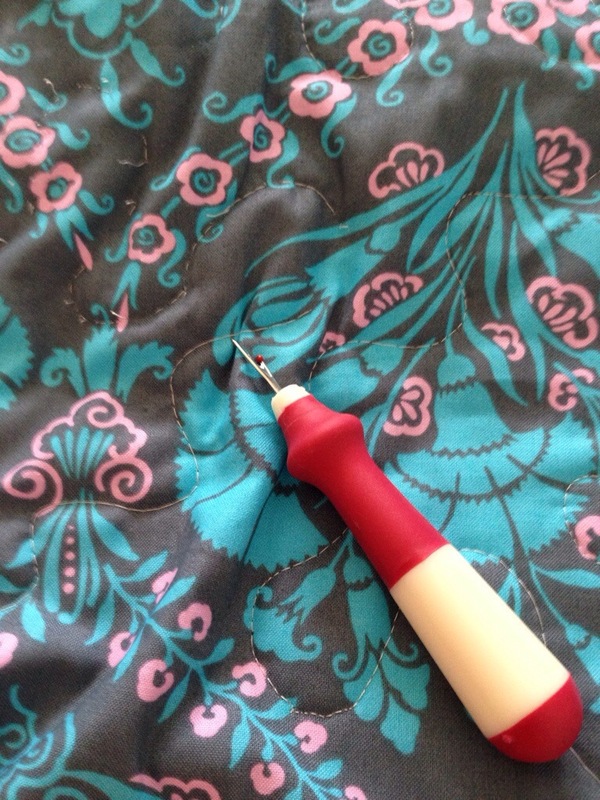 The straight-line quilting is quite time-consuming, and possibly the most boring sewing ever. It had to be done this way, though. 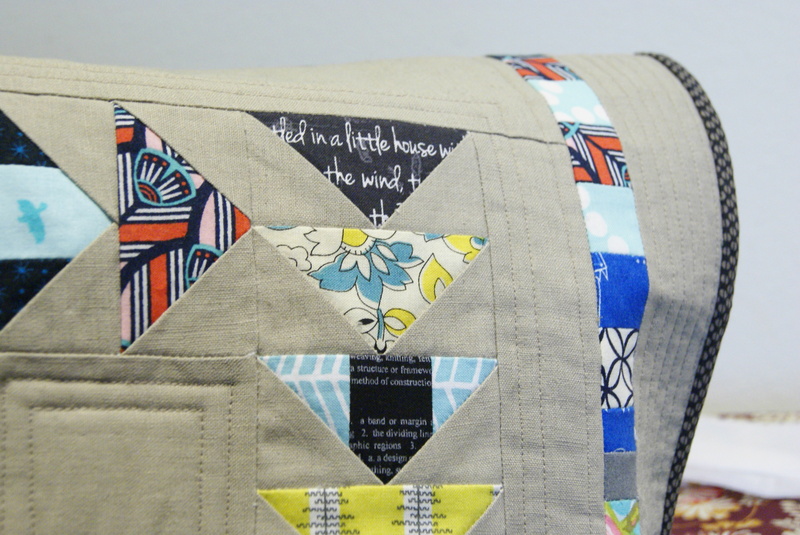 I can’t imagine these quilts without this added level of rich, quilted texture. 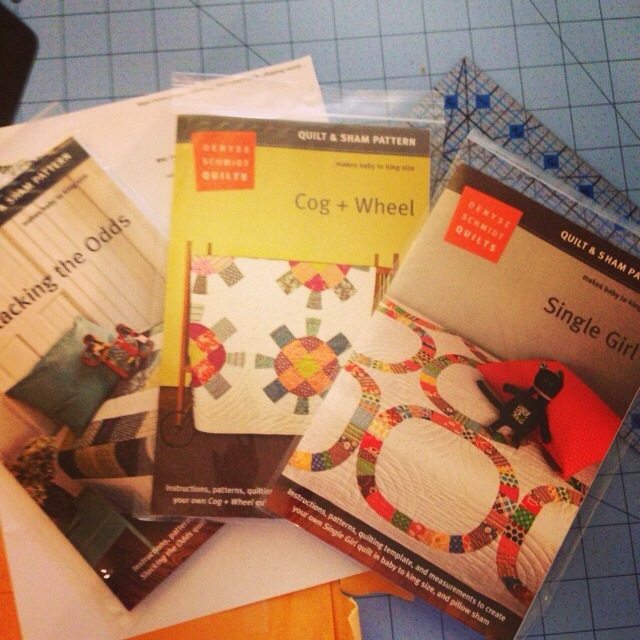 And, as it turns out, I really love the friends who will receive these quilts. As fulfilling as I’ve found this project, I am ready to have it it out of my hair. 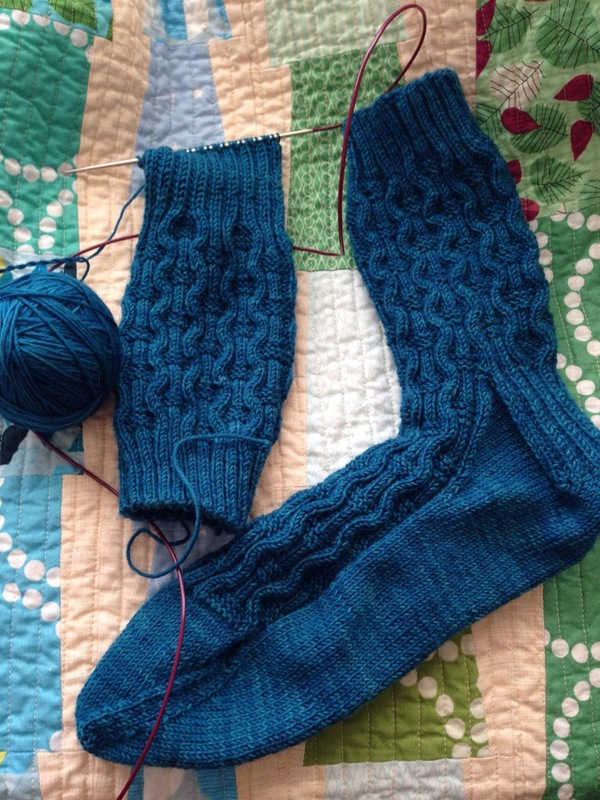 I told him that only someone who really loves him would knit socks this huge, and turn a heel TWICE for him. 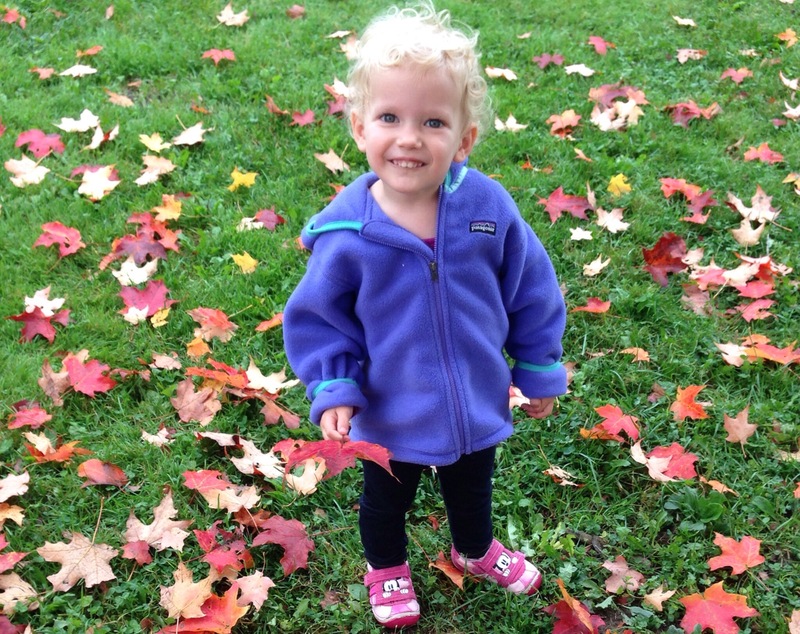 I’m finding that my knitting energy keeps getting redirected though; yesterday, I took Lucy to the park and she flatly refused to put her fleece North Face hat on. It was 40 degrees, and I told her she had to a) wear her hat, b) wear her hood, or c) get back in the green car and go home. She chose her choice: go home. Rather than wear the hat. 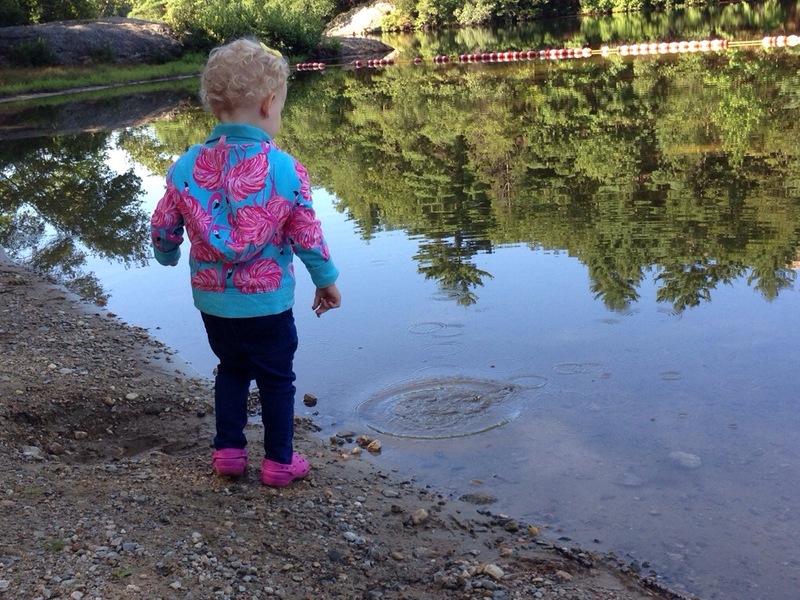 That’s my stubborn kid. On the way home I asked her, “why wouldn’t you wear the hat? It’s a NICE HAT.” Quietly, stubbornly, she said, “No it’s not.” What kind of hat will she wear? “A rainbow hat.” I’m making some mods to Jane Richmond’s Renfrew pattern, and holding double some rainbow-y Tosh Feather, and hope to have a hat to keep away the ear infections by tomorrow. By far, though, the project that took the most love to get through was this little home-dec project I did for a friend. 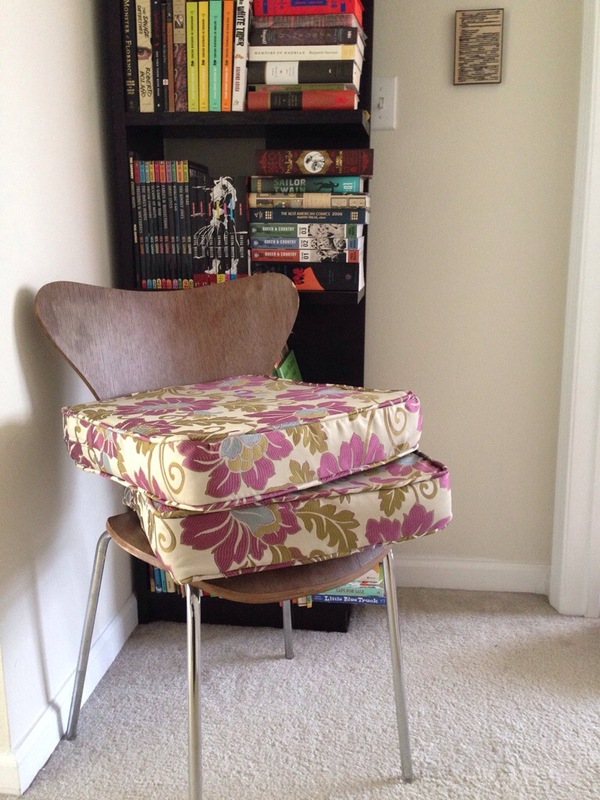 She bought two chairs off Craigslist and the chairs came with black pleather cushions. She didn’t like the black, so she did a Sherry-and-Jon-Petersik and spray-painted them red. But the paint ruined the texture and made the cushions smell. She would never have asked me outright to make the cushion covers, but I offered, because I knew she’d pay through the nose for custom covers on this easy little job. She chose a poly jacquard home dec fabric from fabric.com, 3 yards. 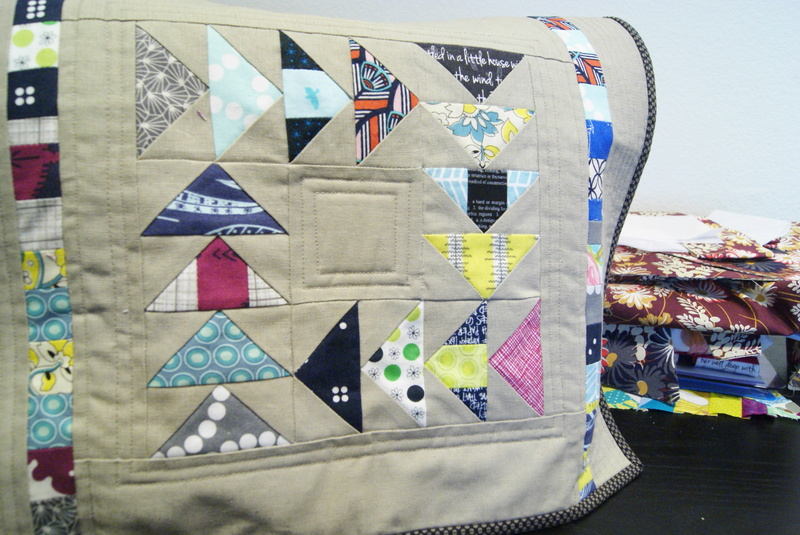 I used this tutorial on Sew Mama Sew by creative little daisy and made these two piped cushions. By far, the worst part was working with the fabric. The day after I started the project Lucy pulled a clump of greenish poly fuzz from her mouth, clearly aftermath from the cushions, and I almost barfed. But I stuck it out, and finished them. They’re not perfect, but they’re full of love. The irony of entering a quilt into the Quilt Photographers category of the Blogger’s Quilt Festival does not at all escape me. and I’m just getting better at them in general. I’m now consistently able to take photographs of a finished quilt that I can be proud of. PLEASE reconsider. 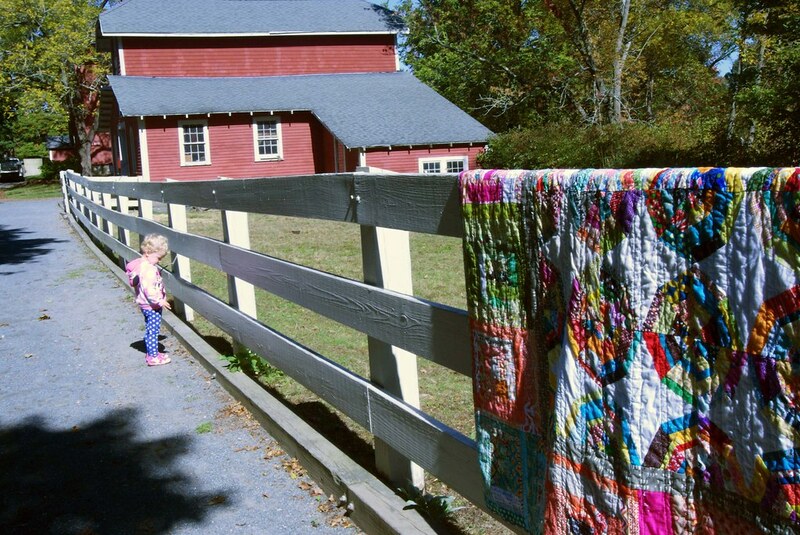 I promise your quilts are beautiful, and you should be sharing them with all of us, so that we can tell you how gorgeous they are. 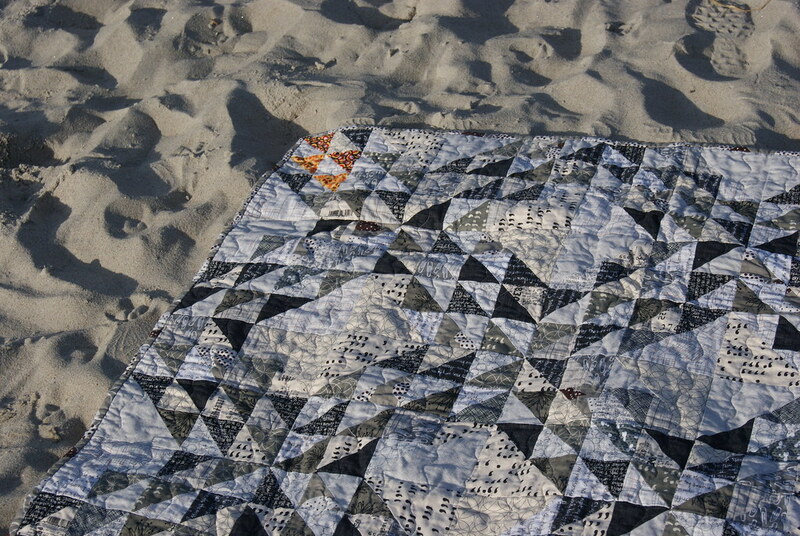 This Ocean Waves quilt was made using the pattern from Denyse Schmidt’s book Modern Quilts Traditional Inspiration but with modifications to block size and number of blocks. 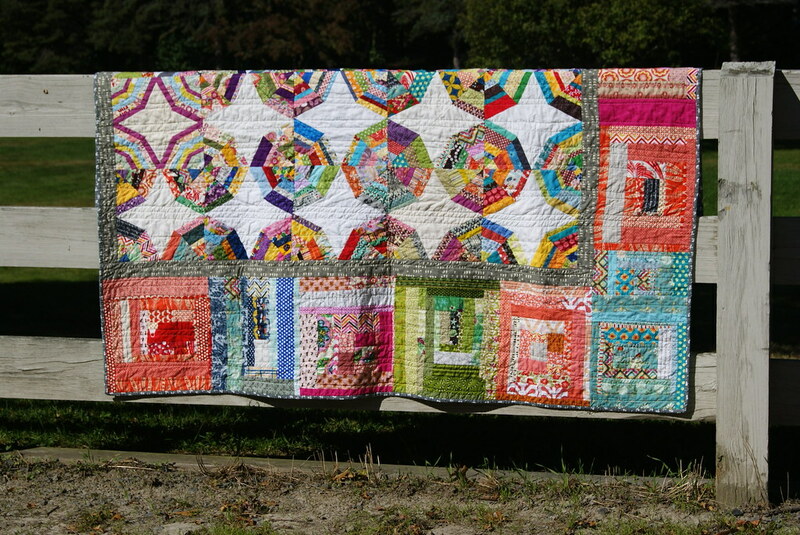 I used leftover HSTs from my X-plus quilt to make the blocks, orange scraps from my stash to make the back, scraps from my first Washi Dress to make the binding, and even batting scraps for the batting. 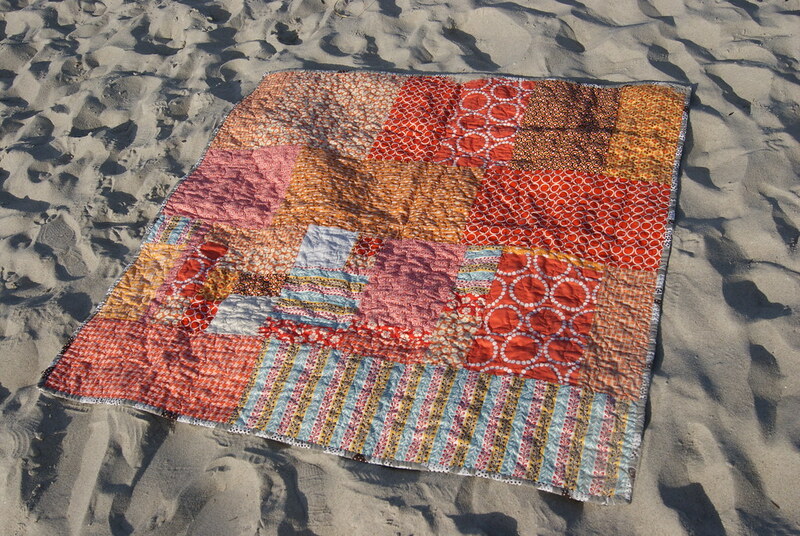 A 100% satisfying 100% scrap quilt. Head over to the Quilt Photographers category and check out the other great quilts (and great quilt photos)! 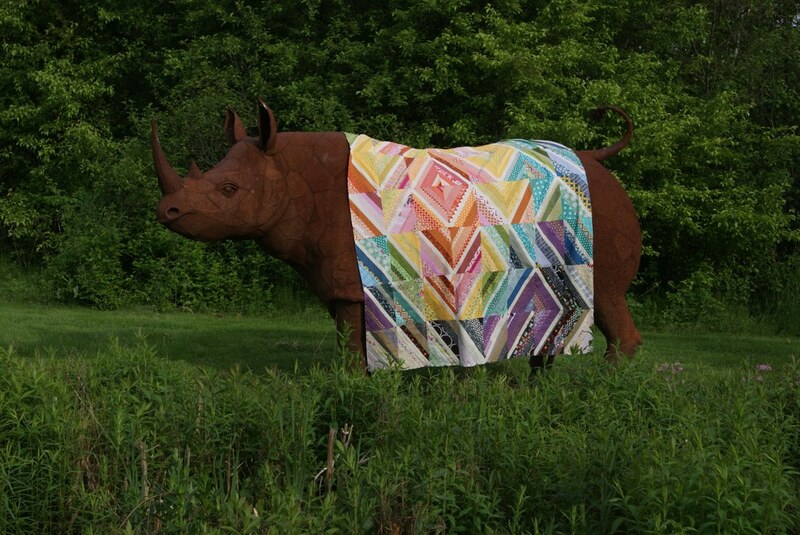 When I read on Facebook that Peg at Sew Fresh Fabrics is sponsoring the prize for the Favorite ROYGBIV Quilt category of Blogger’s Quilt Festival at Amy’s Creative Side, I knew it was time to submit my very first entry. I made this quilt using Rachel at Stitched in Color’s Ziggy Strings tutorial, which she wrote for this past spring’s Scrap Attack Festival of Strings event. 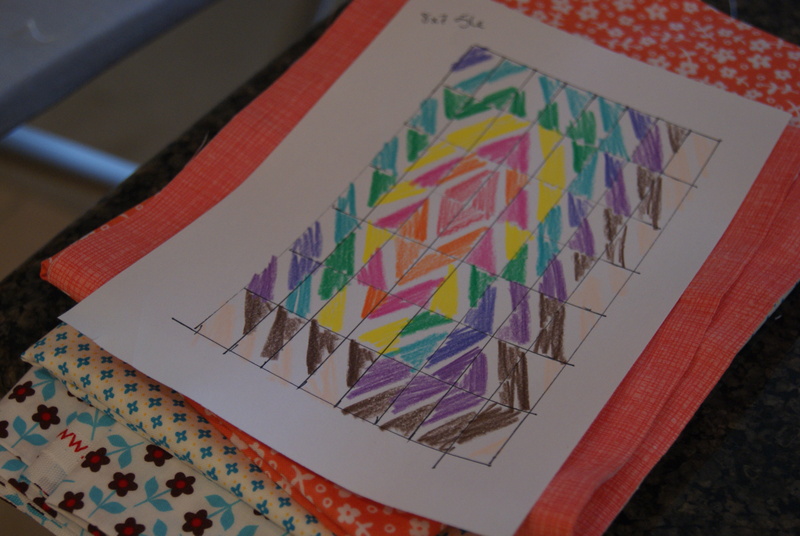 I sorted my mountain of string scraps into color order and sketched this quilt out. 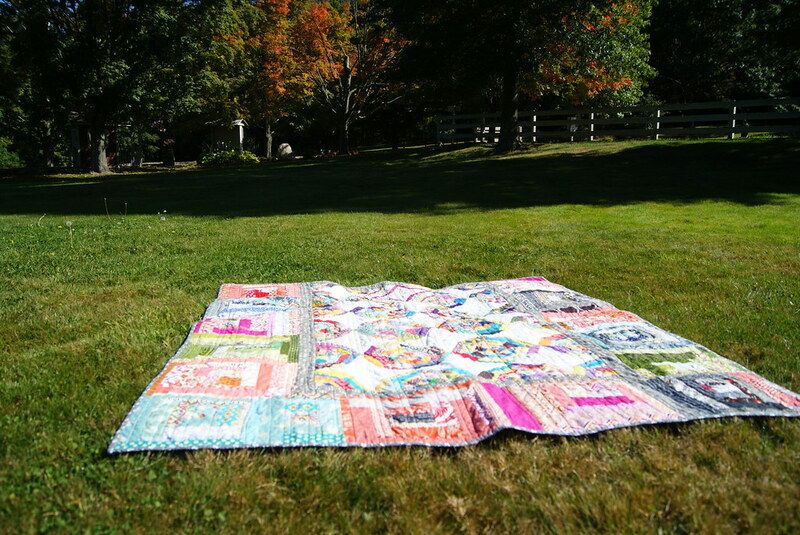 But what I don’t talk about so much is that I started this quilt the morning after the Boston Marathon bombing in April. Lost for a way to react to the scary things going on in my city, I turned to quilting. 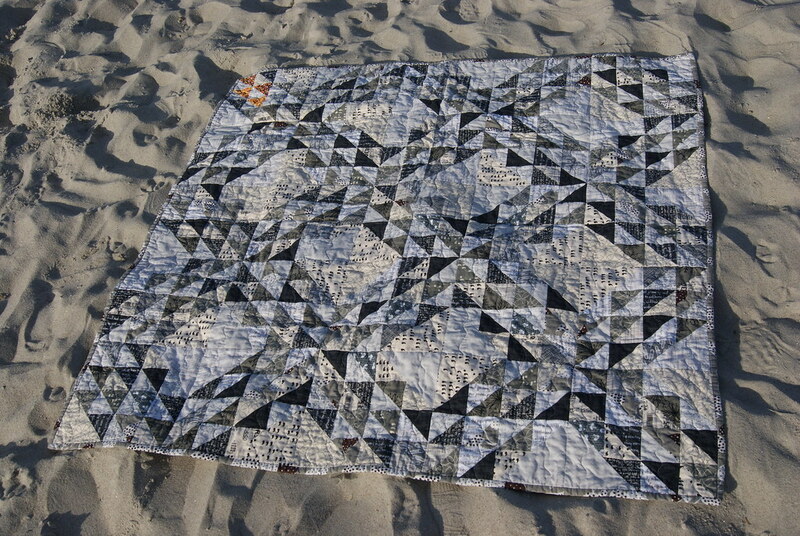 This quilt is my proudest and my best quilt of 2013 (heh so far!) 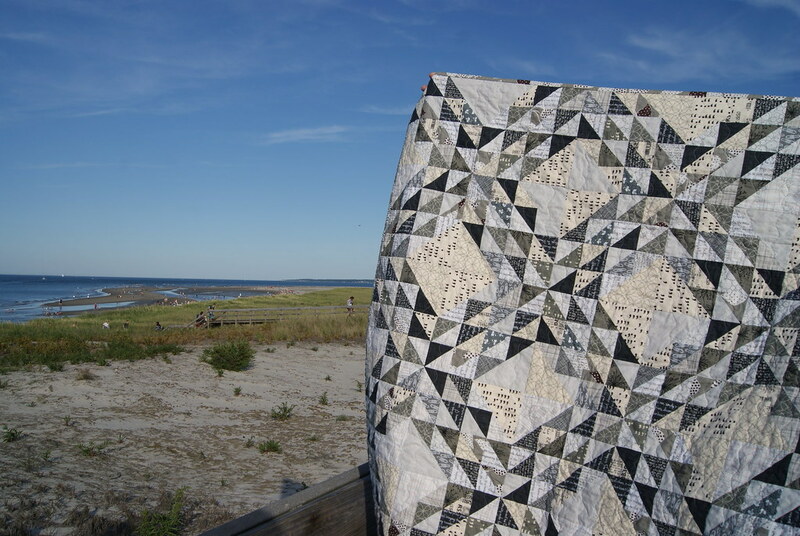 and I’m so glad for the Blogger’s Quilt Festival and the chance it provides for us to look back over our year of work and think about which are our “best” quilts. 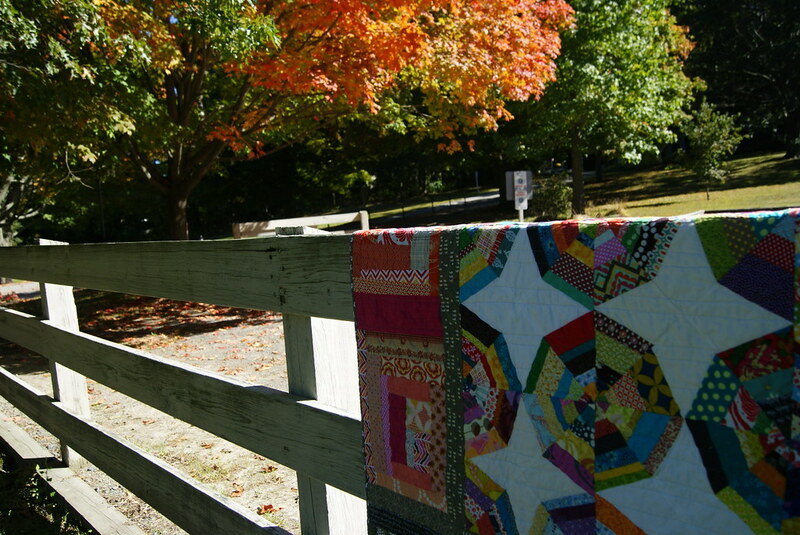 Hop on over to the ROYGBIV category and check out all the fabulous quilts shown there! 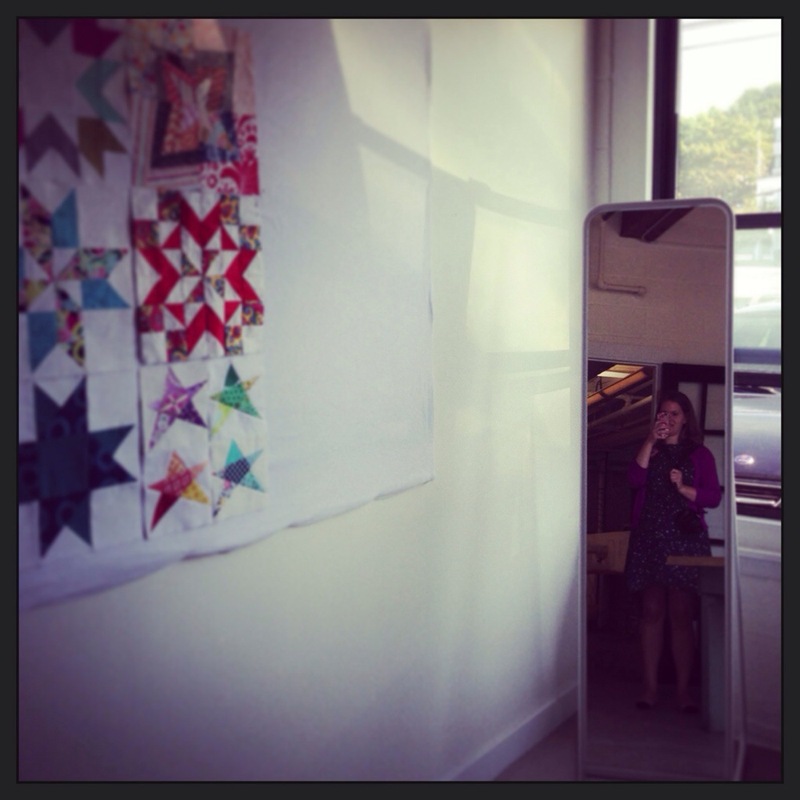 November is my first month as Quilter in the Grace circle of do.Good stitches! I joined the Grace circle at the end of July. I did July’s blocks a bit late, but have been on track and sewing with the group since August. I’m thrilled and honored to be sewing with the Grace ladies. They do some seriously amazing work. I’ve got some high standards to live up to, so I’m turning to an expert: the smart and talented Sarah of Stitching and Bacon. 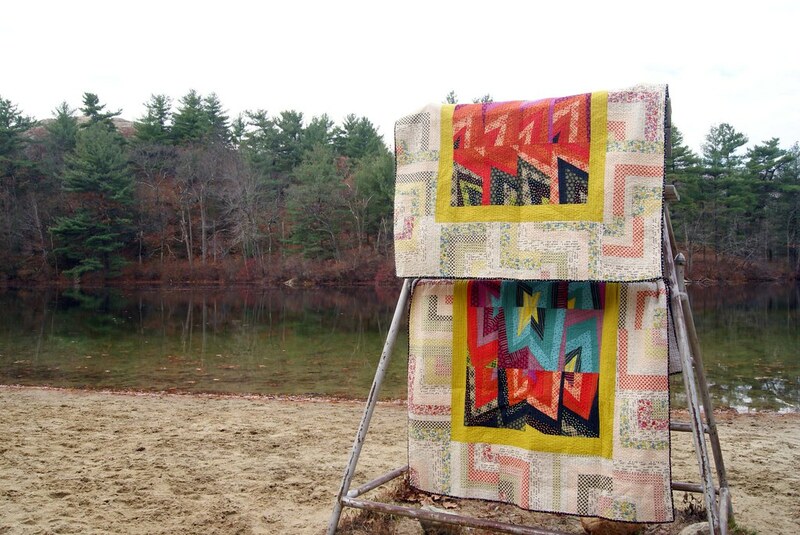 Sarah is a dear blog friend and I pretty much love every quilt she makes, in a “you’d better lock your doors because I WILL steal that” kind of way. 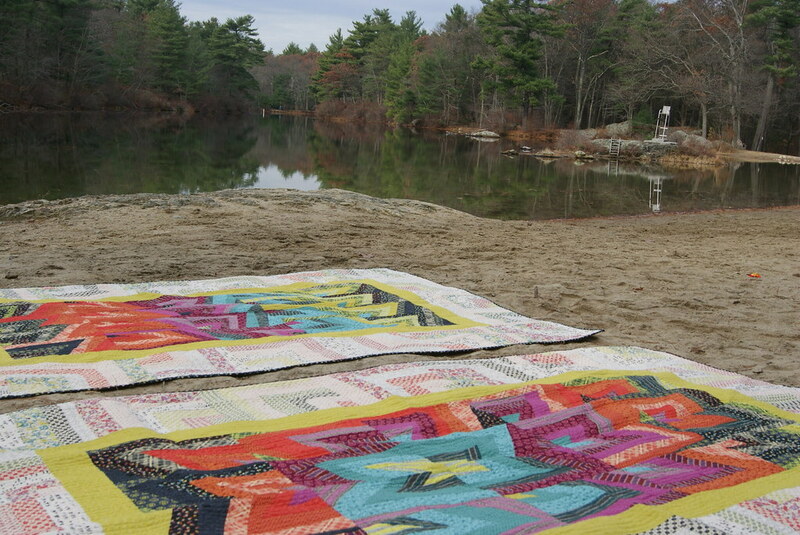 I felt very much like I wanted to steal her Stars Align quilt this past winter. I can’t get her quilt out of my head! 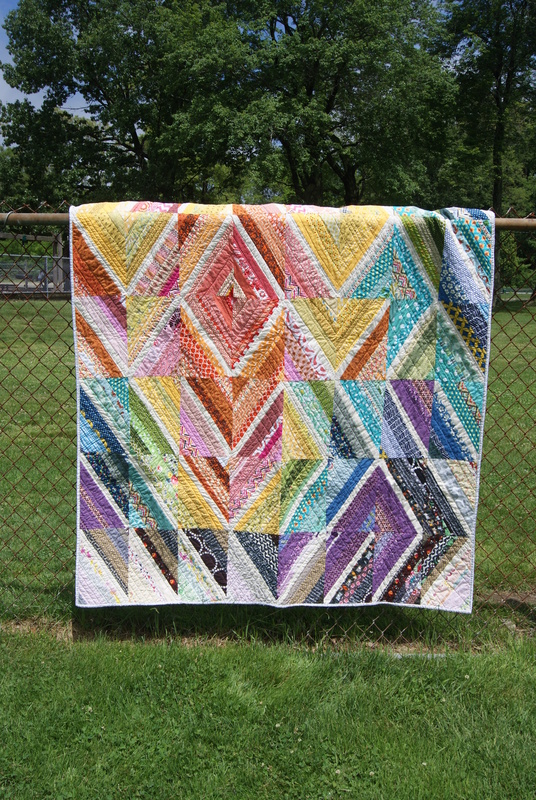 I love the limited color palette she used, and all of the secondary between-block designs created by the skinny-skinny sashing used within the block. 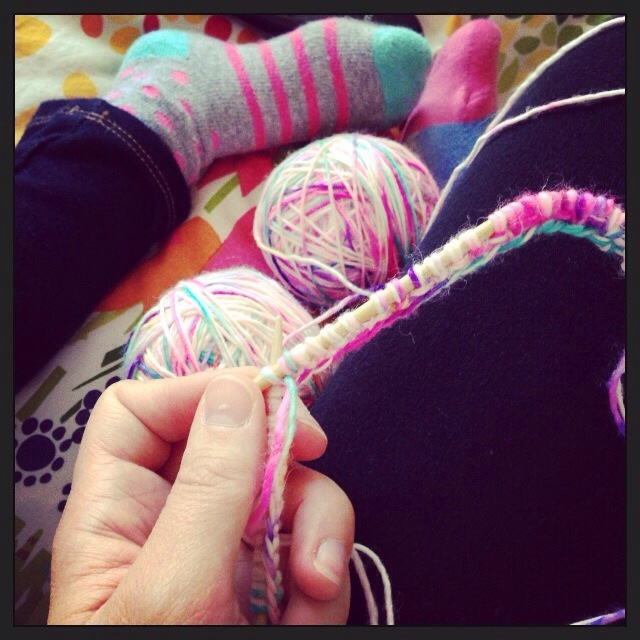 So, Grace girls, we’ll be using Sarah’s Stars Align tutorial to make our November blocks. For colors A and B of the blocks, please use medium grey and mid-true blue and aqua to light blue and aqua. 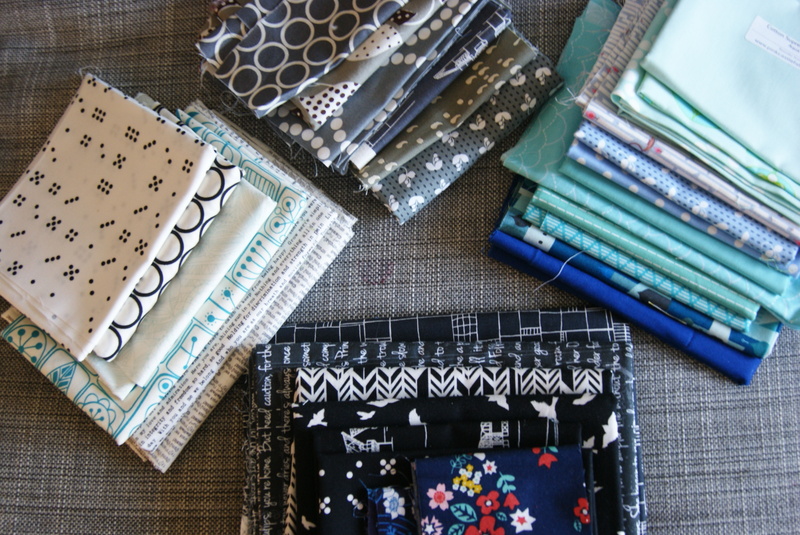 For the lattice lines of the blocks (where Sarah has used white), please use dark charcoal to black fabrics (I think dark navy would also work). I’m a prints girl, so I cut all prints. I know we have some solids folks in our circle, so feel free to use solids for 1 or 2 areas of each block, but I’d rather not have all-solids blocks for this one. 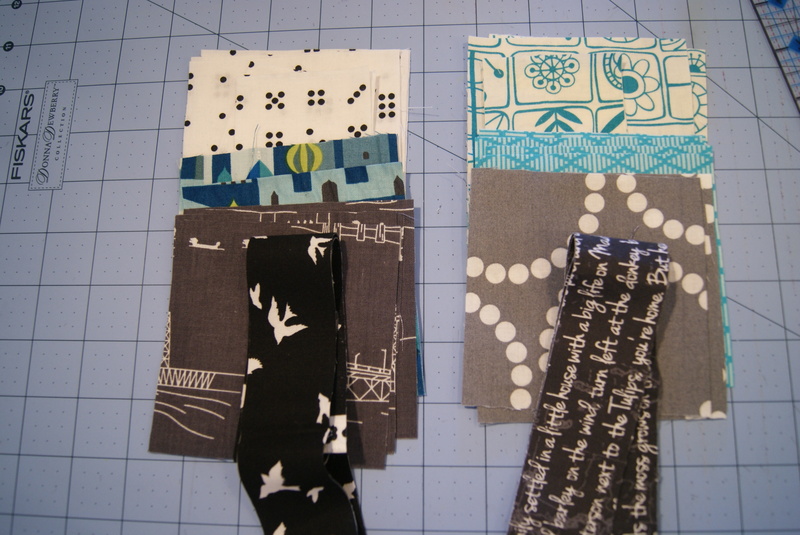 And my two finished blocks, which I whipped up in an afternoon. 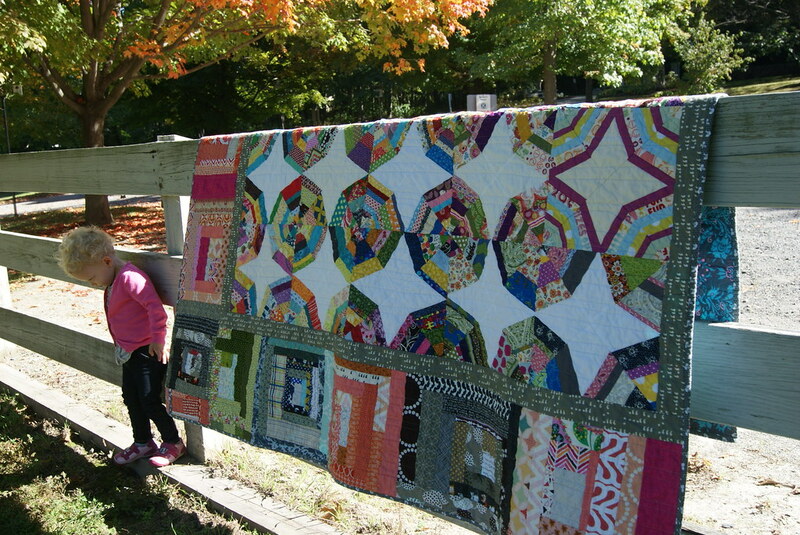 The blocks finish at 13.5” square, and we’ll have a 4 x 5 layout for a 52”x65” quilt. Not bad at all! Let me know if you have questions. Can’t wait to see these start popping up in our Flickr group! 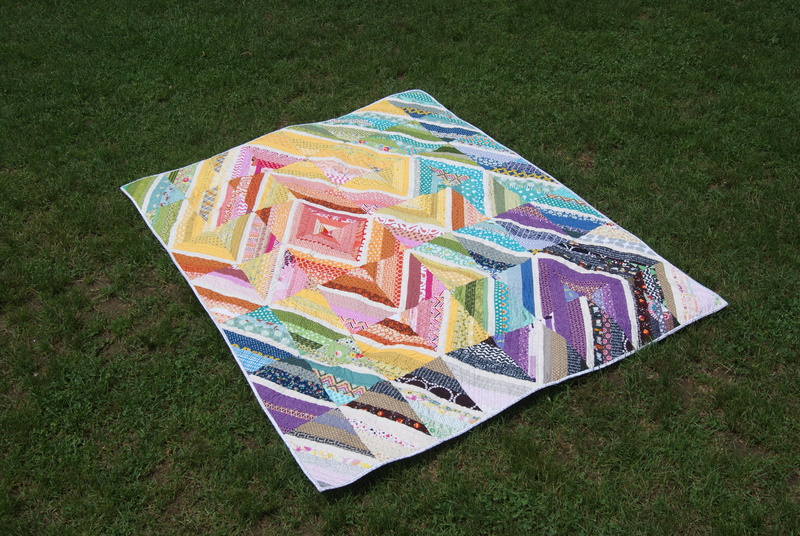 Here, as promised, is your non-tutorial on how I did the center blocks in my Phoenix Twin quilt (there is a photo at the end of this post). I’m fairly sure I’ve seen these blocks around the internet so I don’t think I’m doing anything particularly original here. But I don’t know exactly where to send you to show you how to do them, so find out here! Take a minute and look. It’s got a little “center” bit on the right hand side; then there are wonky chevrons growing up, and then just wonky strips at the top. You can do this! Step 2: Draw chevrons. 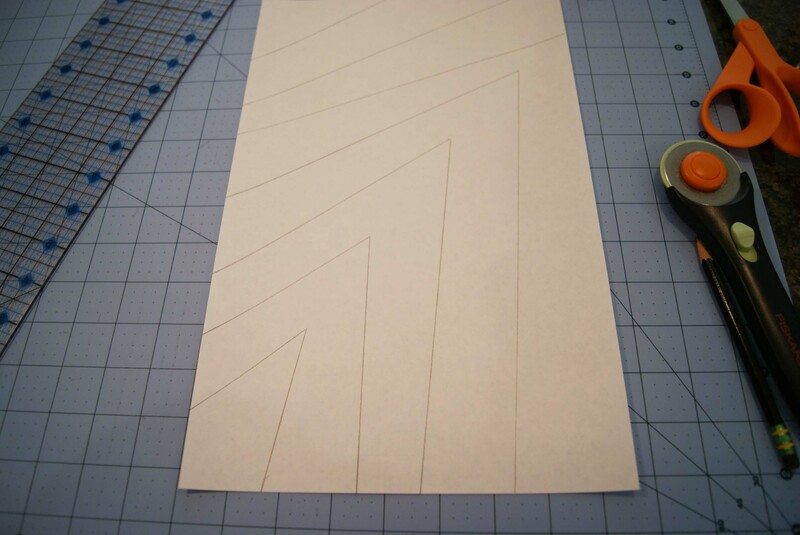 With a ruler and a pencil, draw chevrons rising from one corner of your paper. Remember that your “corner” is going to end up on the opposite side of your drawing; so, if you’re drawing a corner on the right-hand side of your paper, the corner will be in the left-hand side of your block. Because you piece on the other side of the paper. 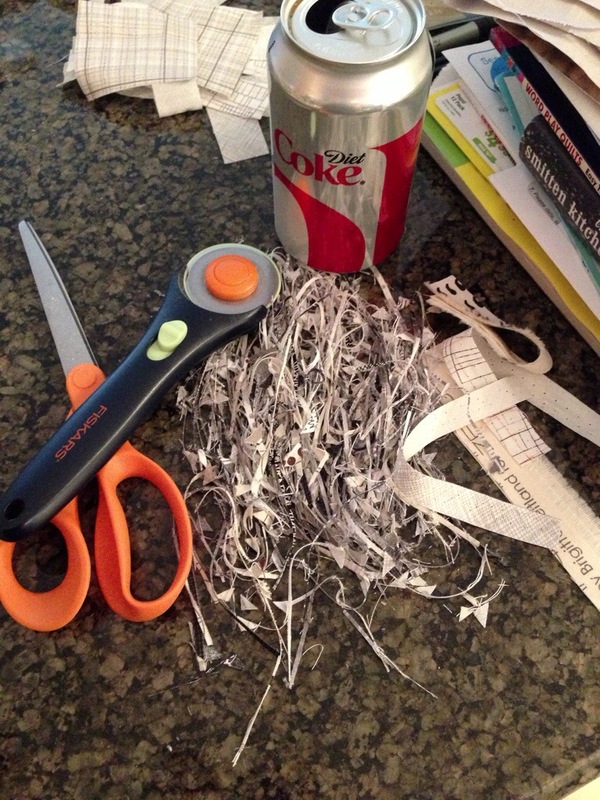 Step 5: Cut your fabric. Remember to oversize the fabric you think you need by at least .75” – 1”. I drew my chevron strips to be about 1.5”-2.75” wide. So I cut strips of fabric that were 2.5”-3.5” wide. (Most, I found, I cut 2.75” wide.) For this block don’t bother trying to cut length. 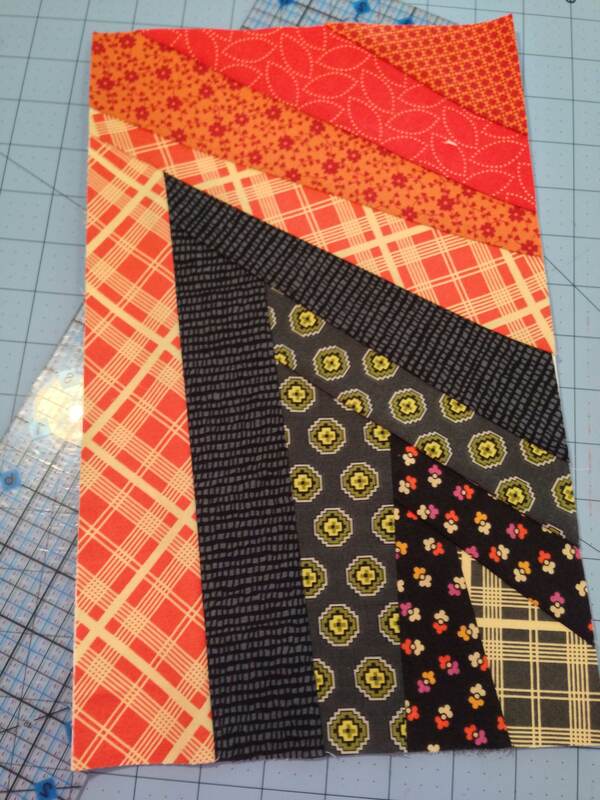 Just cut a strip from your FQ or half-yard or whatever. You can trim off the excess strip length after you’ve pieced on your strip and then use it to piece the second half of the chevron. I found that my little “center” bits often needed to be 3.5” wide. The little centers are also great for using up little scrap ends! Step 6: Paper-piece. Go! I’m no paper-piecing expert. My tips begin and end at: use a tiny dab of glue stick to hold down your #1 piece aaaand that’s pretty much it. 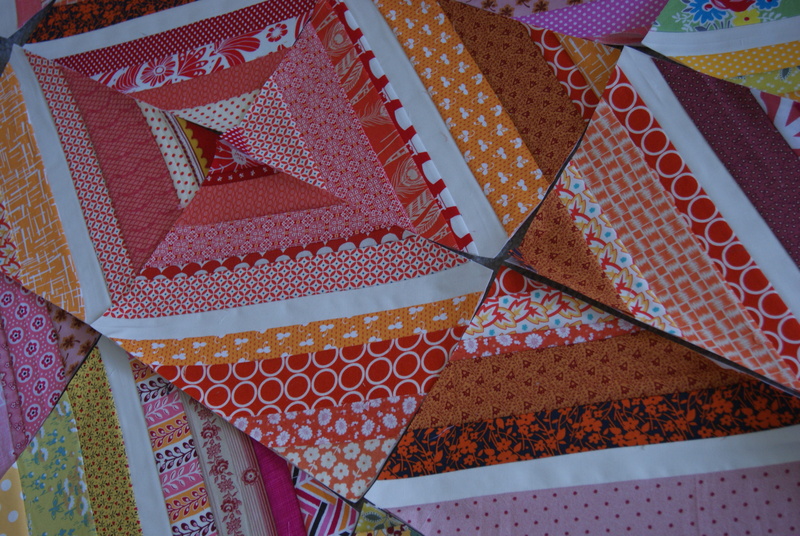 If you don’t “do” paper-piecing yet, check out Faith at Fresh Lemons’s post about the method (this is the post I learned from, ya’ll). 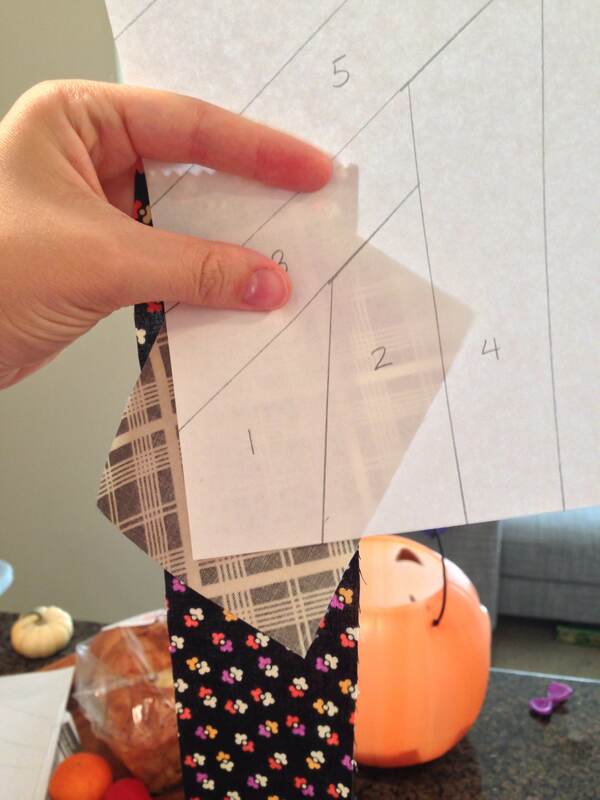 Recently, Michelle wrote up a great handful of tips about the things she’s learned while paper-piecing, and it’s worth a look as well! For this particular block, the trick is to make sure that the top of the fabric you’re sewing on extends above the point of the chevron segment by at least 1/4”. See above? 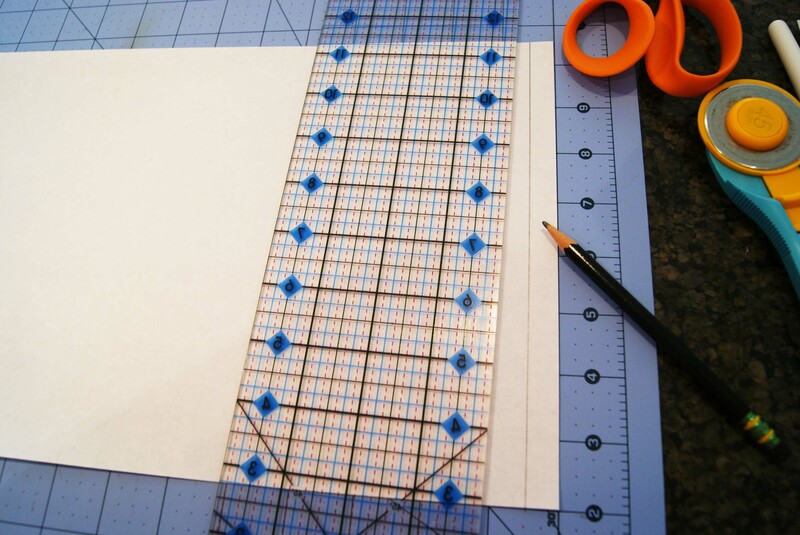 My Duet Dot strip is lined up so that it will flip over to cover the top point of the #2 segment by about 1/4”. Step 7: Trim. 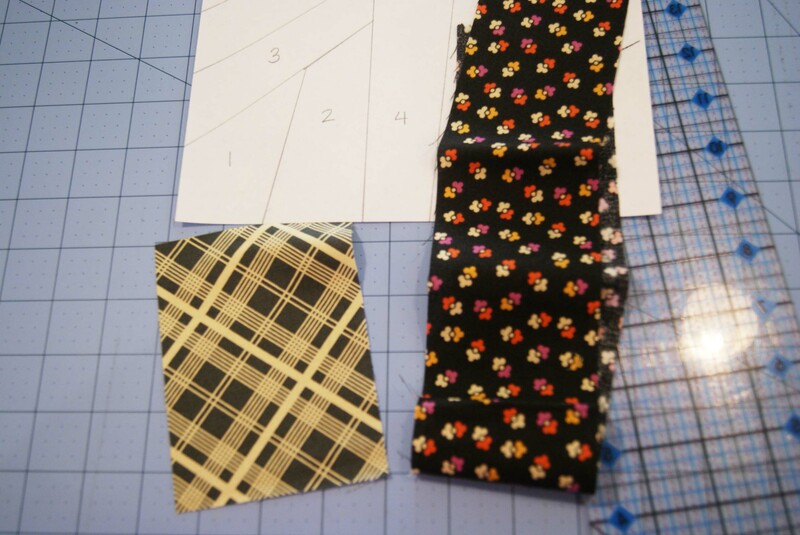 Flip your paper back from your seam and trim off excess fabric (use your ruler to create a 1/4” seam allowance), then press the new seam with a dry iron and use the paper as a guide to trim off the excess fabric outside the rectangle. Step 8: Repeat as needed until your chevrons are all pieced. 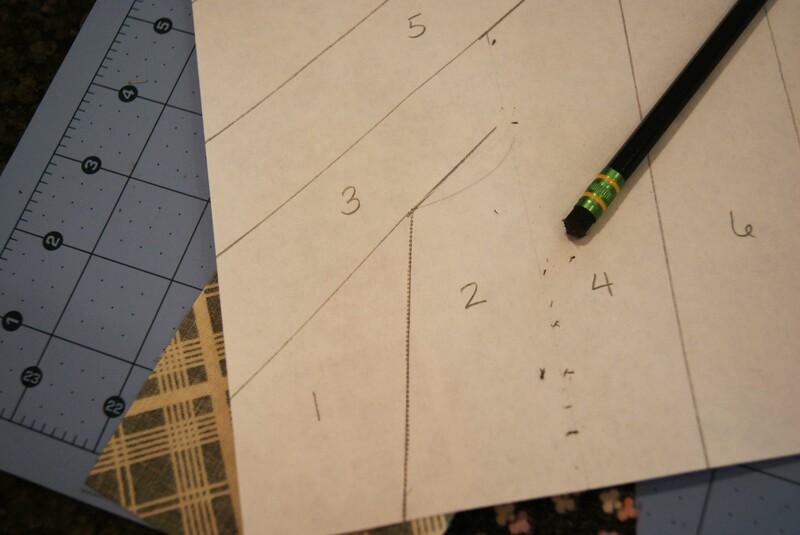 Basically, if you’ve paper-pieced before, all you need to know is that you can draw the lines with a ruler and a pencil. 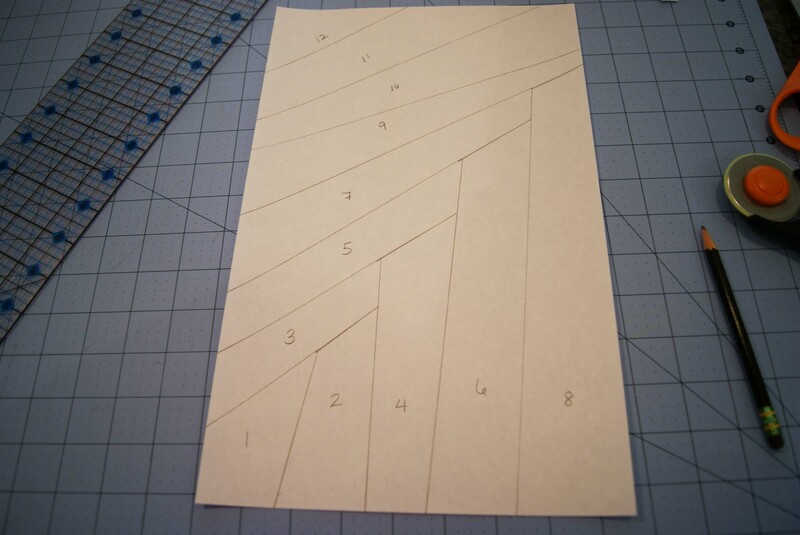 (I have to thank Charlotte at Displacement Activity for showing us all we can do this; I have probably also seen other people mark paper-pieced patterns with pencil.) 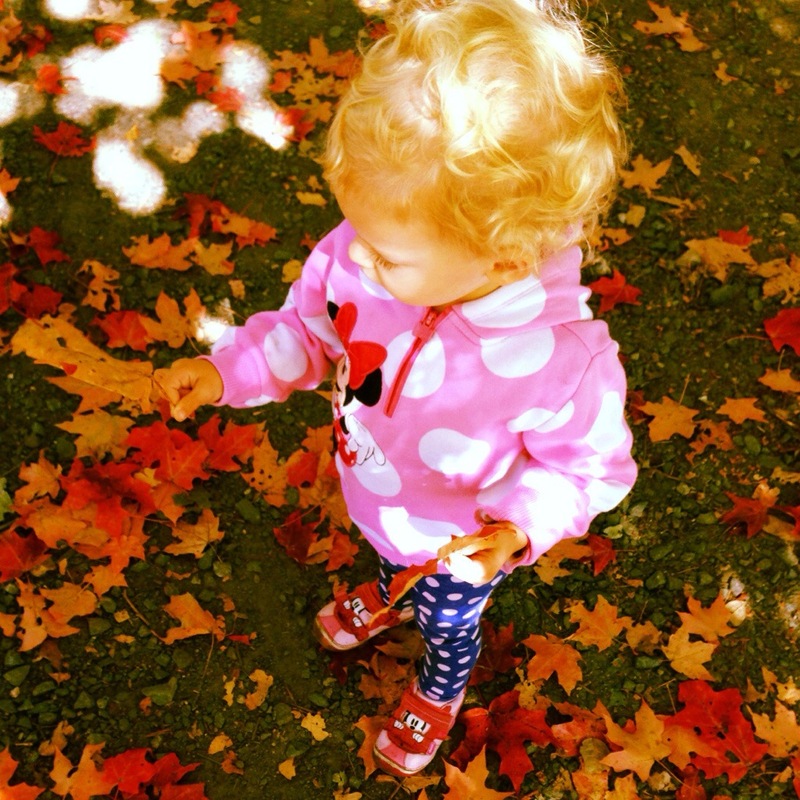 With really careful color planning, you can do really fabulous things with layout. Let me know if you try it! And let me know if I can help or clarify anything. 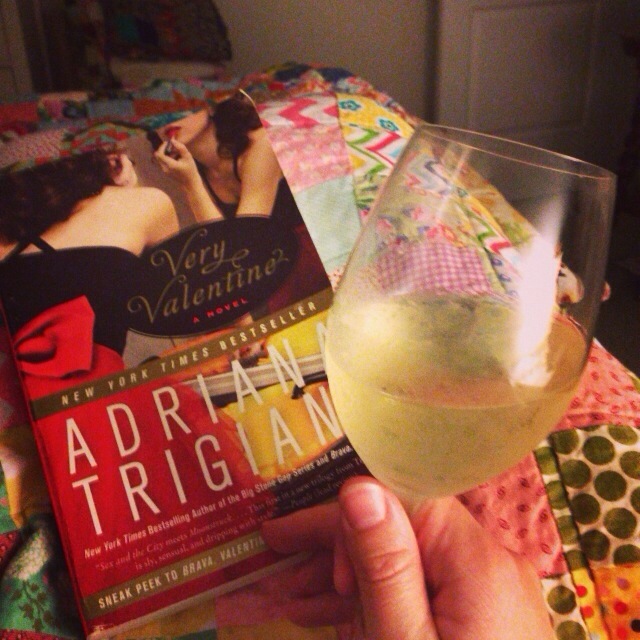 Oh, hello, two weeks that went by without a blog post. I’ve been ever so busy, in the best possible way! I realized Christmas is coming. And so soon! So I went bats for hats. 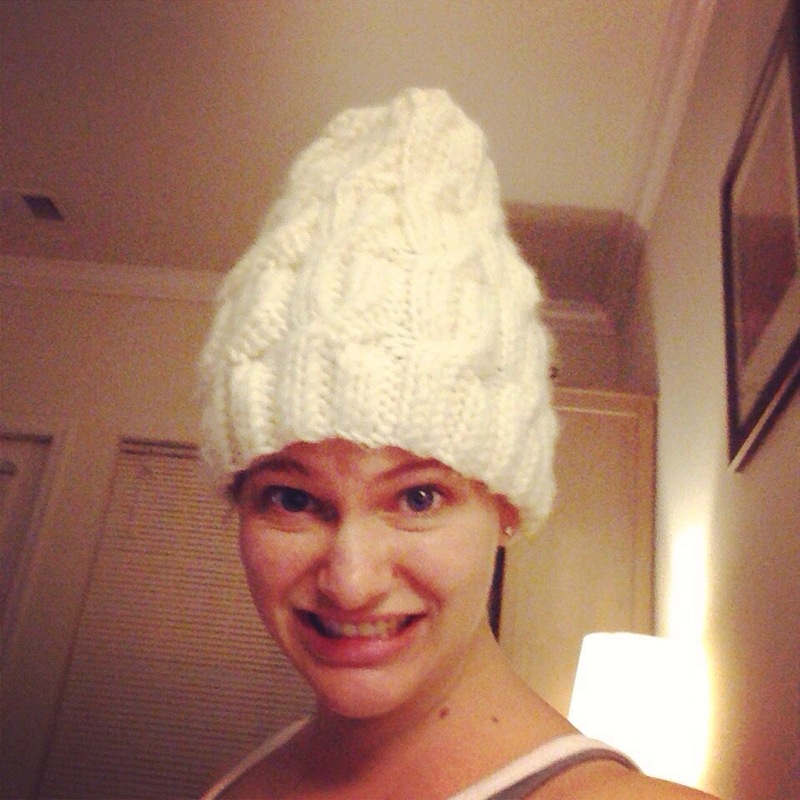 I also knit a hat dud. 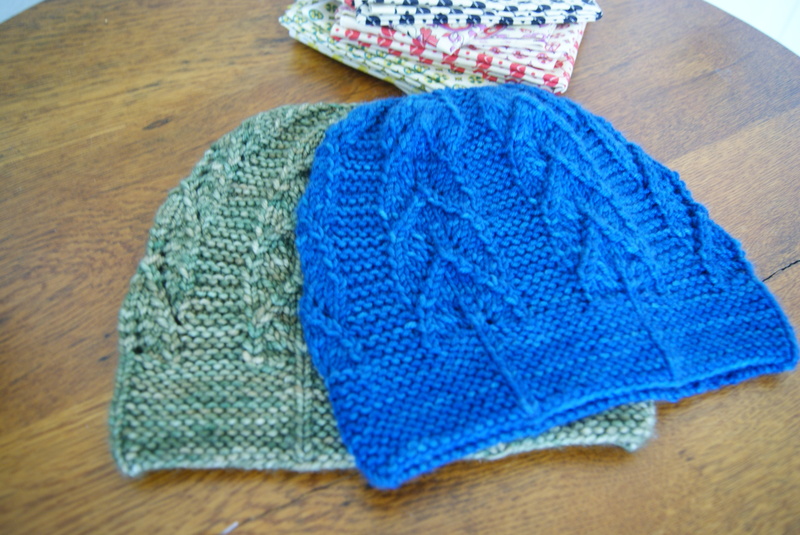 Purl Soho’s Chunky Cabled Hat, knit up in some heathen stash acrylic yarn. This might have turned out better had I ponied up the bucks for the gorgeous-looking Super Soft Merino, which undoubtedly has better drape. As it is I looked like Marge Simpson. I’m considering: trying to shrink the hat in the washing machine, adding a pompom (go bit or go home amirite), or giving it to one of my more-stylish younger sisters who seem to wear everything fabulously. I will not be frogging back or futzing with it in any way that requires real effort. 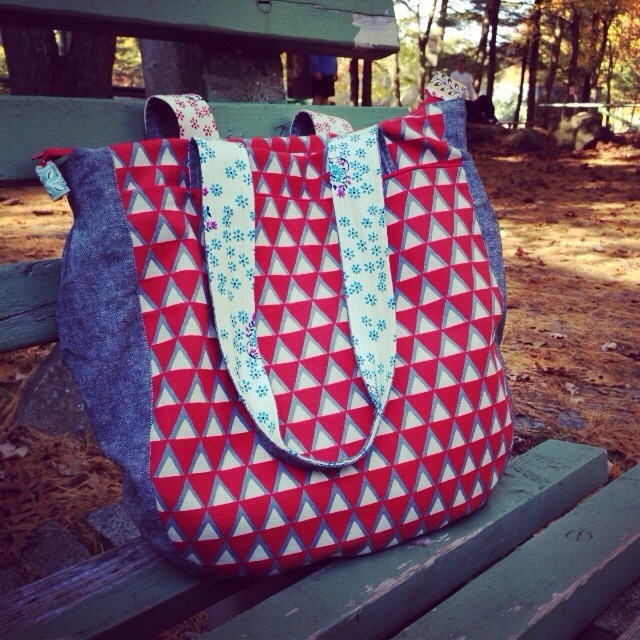 I made a Super Tote, too! I don’t have much to say about this pattern that others haven’t already said; that Noodlehead knows how to write a pattern. 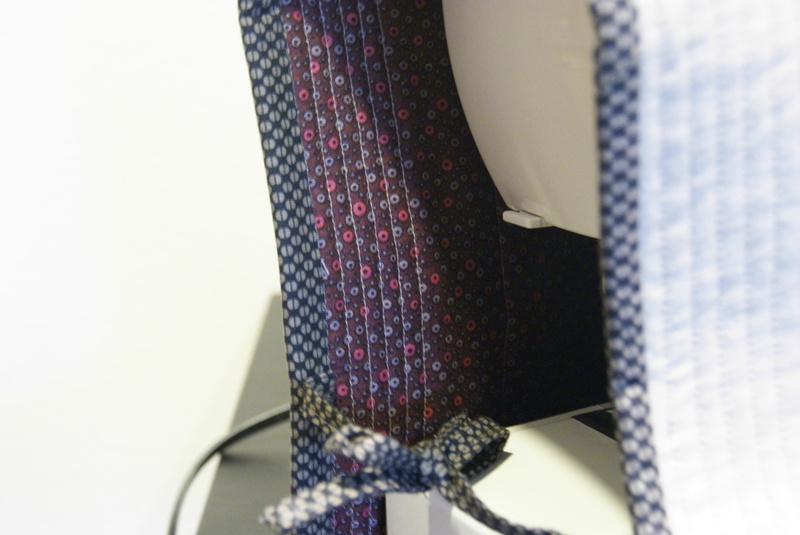 I will say that if you choose Essex Linen for your exterior gusset, DO choose to interface it. I did not, and the gusset is a little floppy for my taste. I went to a Victoria Findlay Wolfe lecture hosted by my guild last Friday. (I wrote a little writeup of the lecture over at my guild’s blog.) You guys? I think Victoria Findlay Wolfe is a genius. 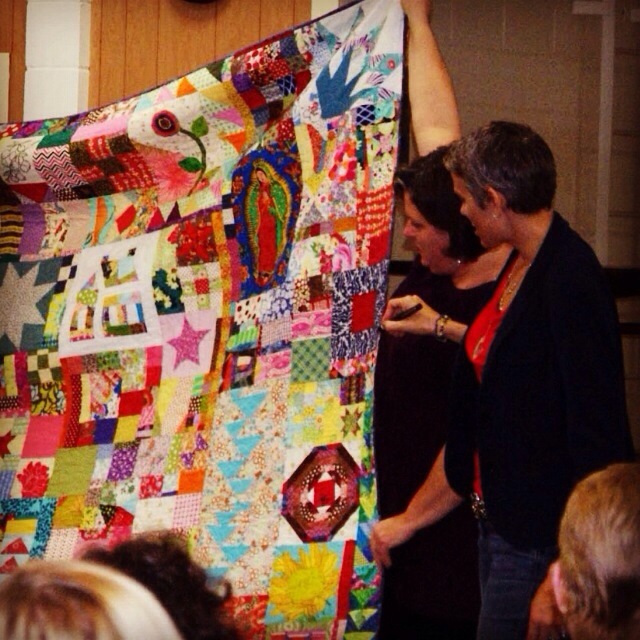 Her lecture was luminous and inspiring; her quilts even more so. I’m still working out what to think about what she had to say (there’s always more fabric! 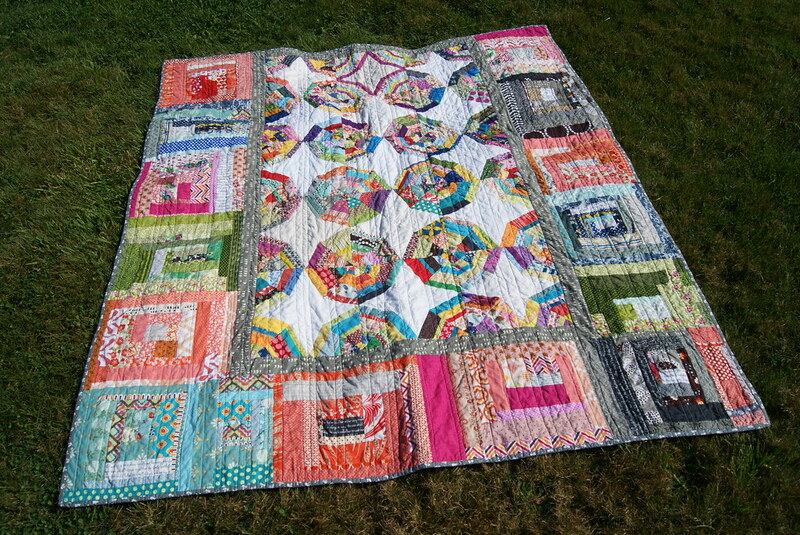 cut it up and use it; never make the same quilt twice, try something new every time; make the quilt you said you would never make; if it’s not working cut it up; challenge yourself by using the fabric you think you hate) but I know that 100% of what she said is true. I also worked hard at soaking up every last bit of fall sunshine before we fall into the cycle of 6 hours of grey daylight every day all five months of winter. Oh, and I finished a little quilt top. No big deal. Yes, this is the first of the two twin quilts I’m making for my friends living in Phoenix (so I’m calling them the Phoenix Twins). I started the second one today and I can tell it’s going to go very quickly. I’ve worked all the drama out of my system on the first one. I’m quite pleased with how this top turned out. I’ve had a couple of questions about how I made the center blocks for this quilt. I took a few process photos today and will post a little behind-the-scenes tomorrow. You don’t need a tutorial, for goodness’ sake. They are just improv-pieced on a paper foundation (and I owe a lot to Rachel’s Ziggy Strings tutorial for helping me get here). Check back to see how it’s done! 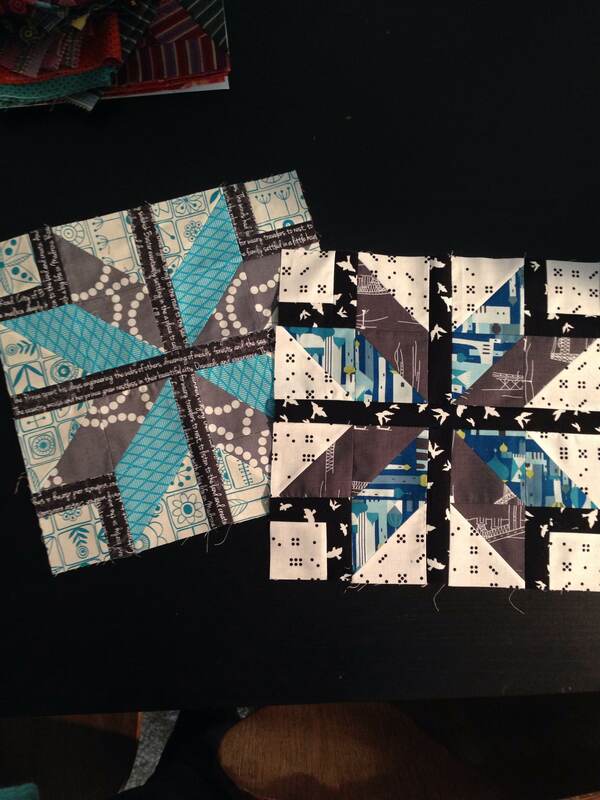 Remember when I won the spiderweb lottery blocks at my guild meeting in June? I felt like the luckiest gal alive. 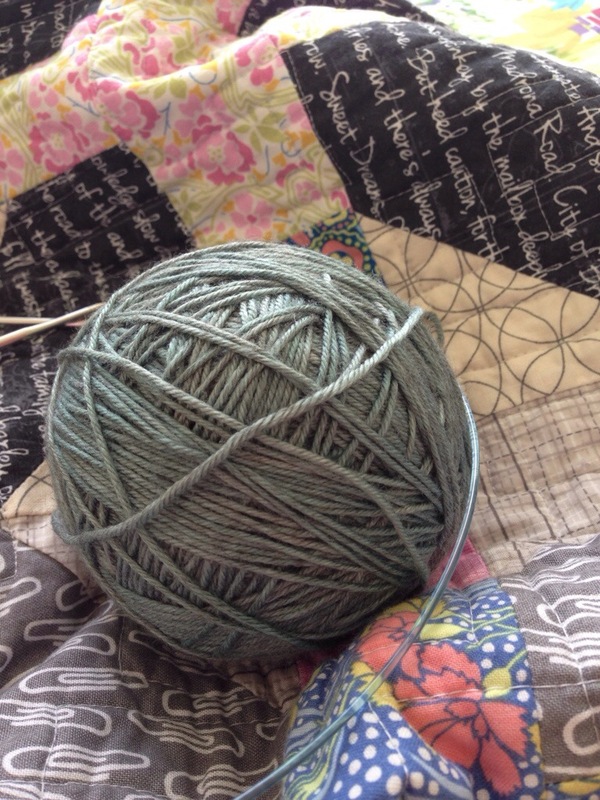 I knew I needed to make a few more spiderweb blocks, sure. And I had a funky buttload of string scraps to use (even after Roy G. Zig). I felt sure that my beloved and much-coveted spiderweb quilt was close at hand. A quick finish! Say it with me, in a Borat voice: NOT. My first problem with this quilt I knew before I even left my guild meeting. 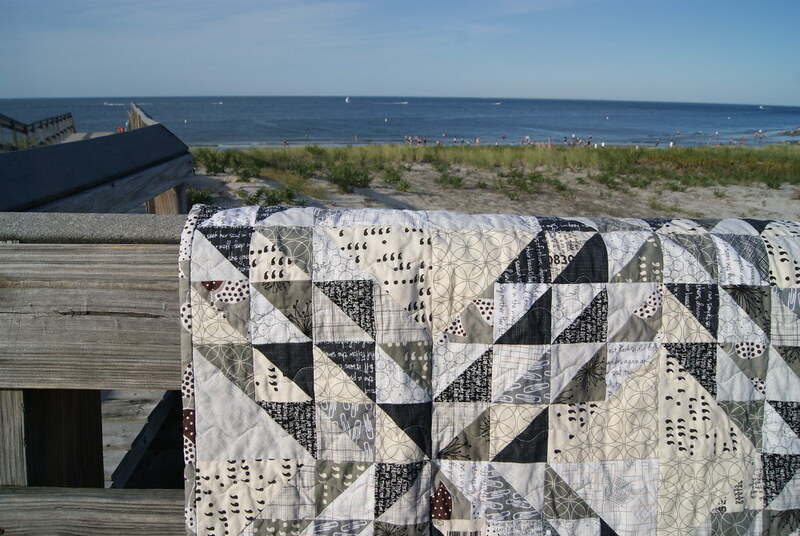 This is a block that requires very consistent measuring and piecing to make all the star points meet correctly. If any one of my guild members had made 30 spiderweb blocks, all 30 of theirs would have made a perfect quilt. As it was, I had 16 blocks made by different hands, and the star points were just not going to all meet. This is the blessing and curse of bee quilts. I’m SO bowled over by the blessing of owning a quilt made by some of the most talented quilters in my geographic region, don’t get me wrong. But our points don’t match. I know, call the quilt police. My second issue with this quilt was that given my current quilting commitments (Penny Sampler, Phoenix Twins, two bees, some guild stuff, and holiday sewing looming ominously) I just knew I couldn’t scrape together many more spiderweb blocks. OK, I couldn’t do ANY more spiderweb blocks. But then you brilliant people out there on the quilternet saved the day! 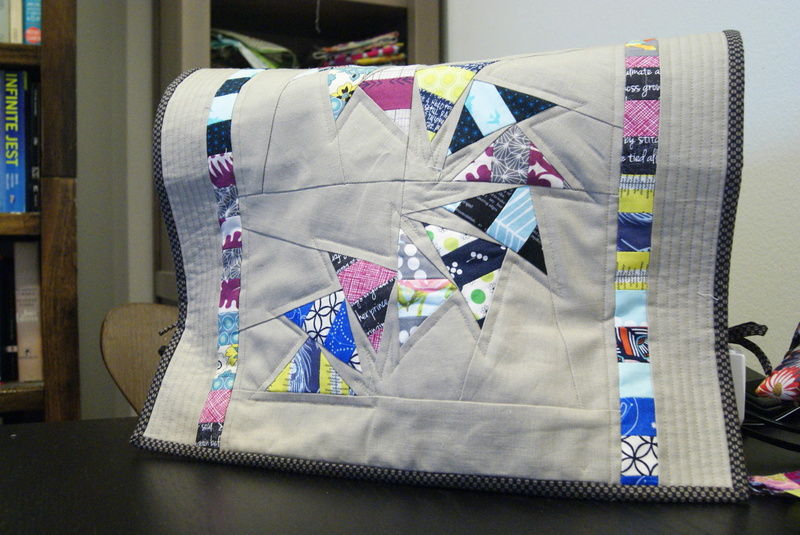 Kelie of Craft Nurse Quilt posted this amazing finish on Flickr. I was struck by the fact that I didn’t HAVE to make 14 more spiderweb blocks! I could make more blocks, sure, but I could do them however the heck-o I wanted! 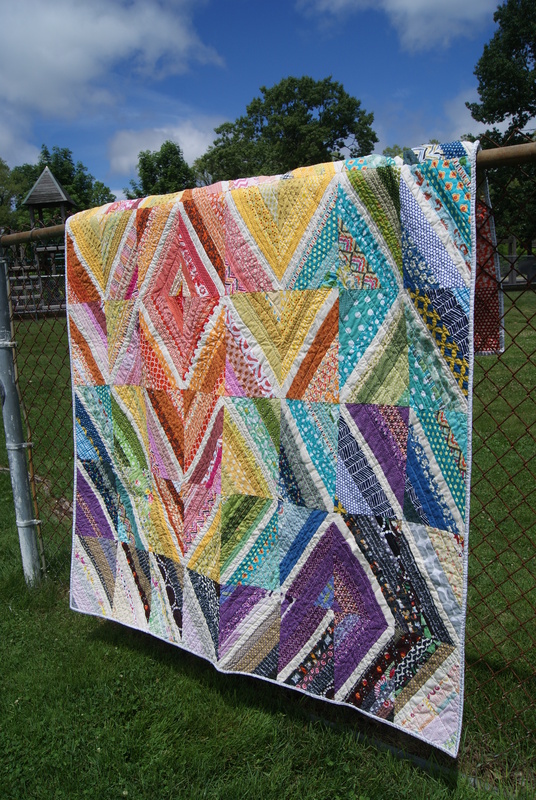 Then enter Kelly’s fabulous Serendipity scrap quilt, and the rainbow blocks Mary’s churning out. 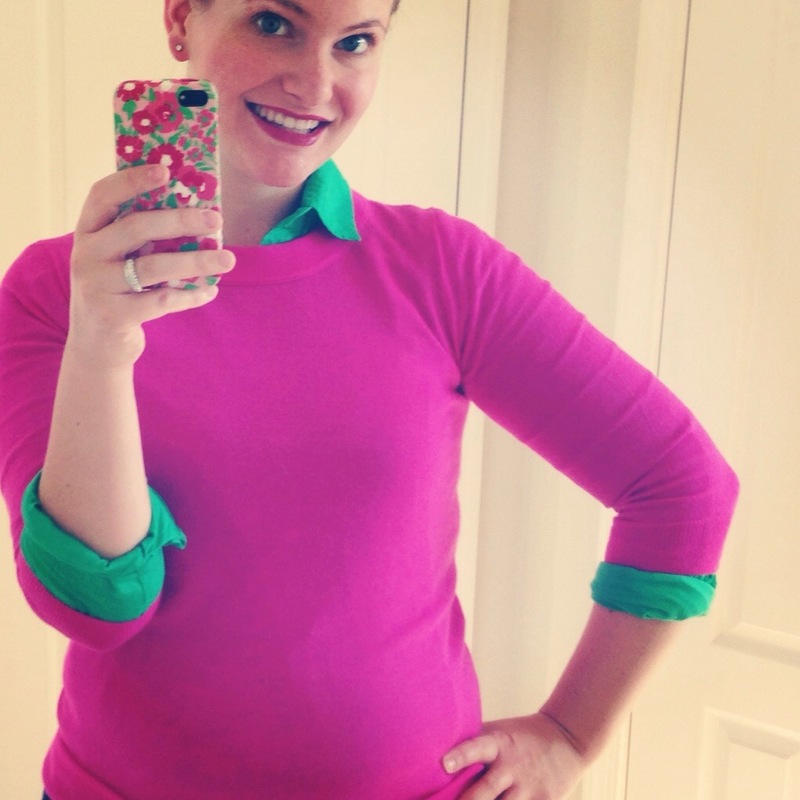 Why not some easy-peasy improv log cabiny blocks? Paintbox style? Around the edges? Quick, scrap-hoovering, perfect. This plan looked fabulous and was so fun. 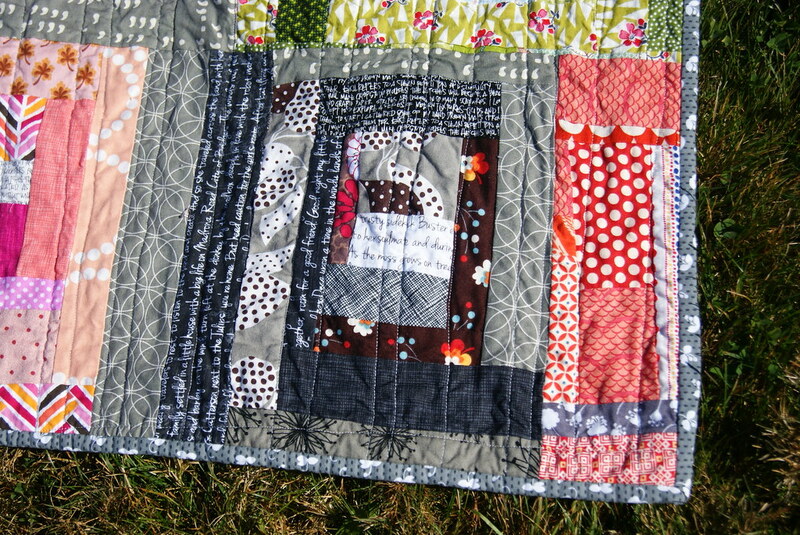 Enter problem #3: then when I attached my sashing and improv blocks, the top wouldn’t lay flat. No amount of steam could flatten the sucker into submission. So I thought, fine, okay, I’ll just stipple this bad boy and call it a day. HA. Problem #4. My backing wrinkled up twice and my front wrinkled up once before I had even an eighth of the quilt stippled. Then I spent a whole naptime watching a trashy movie and spitefully seam-ripping. 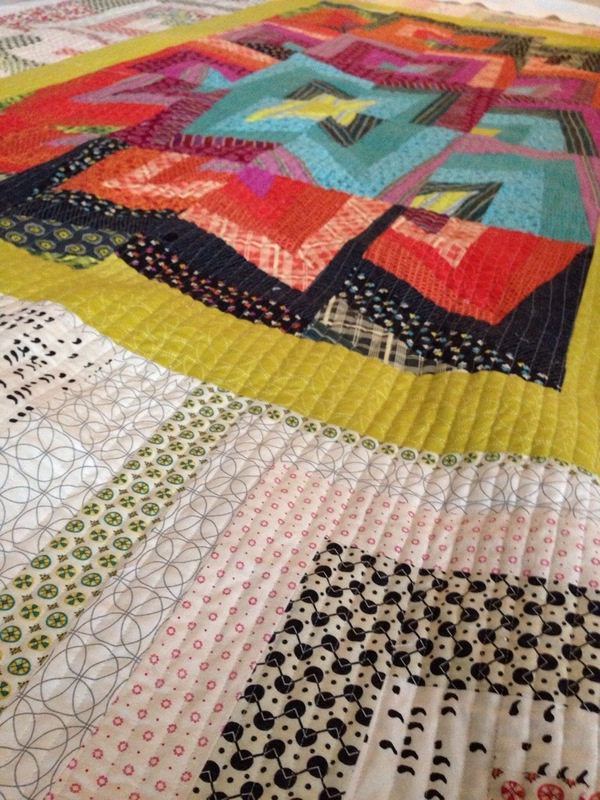 I love this hot mess of a quilt. Thanks to the SMQG who made the blocks, and all of you who inspired me along the way! 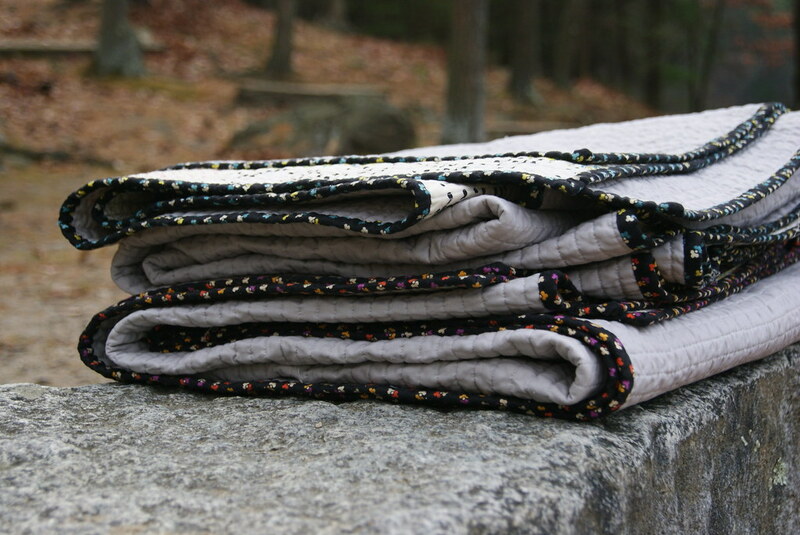 This is going to be my happy-times snow-days cuddle quilt this winter, I know it.